MINISTER FOR JUSTICE Frances Fitzgerald has said there are no plans to strengthen laws that protect emergency services staff from attacks. However, frontline staff believe that more could be done to protect them. Responding to a parliamentary question from Independent TD Terence Flanagan, who asked if current laws are sufficient, Fitzgerald said current legislation recognises “the gravity of any attack on emergency service personnel and members of An Garda Síochána who are carrying out their duty”. “The penalties which are in place clearly underline the seriousness with which such attacks are viewed,” she said. Under Section 19 Criminal Justice (Public Order) Act 1994, anyone who assaults a medical worker or peace officer could face up to seven years in prison, while impeding their work could result in a six month sentence. Particular liaison is maintained with fire services and local authorities in the run up to Halloween and on Halloween night itself, in the context of overall policing plans to respond to issues of public safety and anti-social behaviour which can arise during this period. Responding to the same question from Flanagan, Community and Local Government Minister Alan Kelly said attacks on emergency services personnel are “completely unacceptable”. 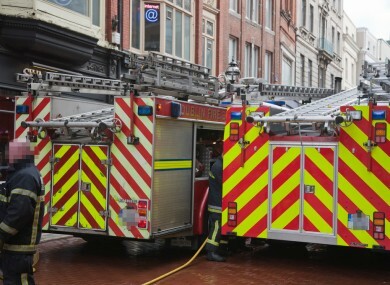 Chairman of the Irish Fire and Emergency Services Association (IFESA) John Kidd said that this is a particularly dangerous time of year for emergency staff. Kidd stressed that although it may seem to children that the fire brigade are simply ‘ruining their fun’, smoke from a bonfire can cause serious respiratory issues. On the protection of staff, he said that the majority will experience some form of assault every year. Kidd added that he would like to see more laws passed to ensure that staff are protected. Email “Attacks on emergency services 'utterly unacceptable', but protective laws won't be improved”. Feedback on “Attacks on emergency services 'utterly unacceptable', but protective laws won't be improved”.